On May 13, 2005, Star Trek: Enterprise ended its four-season run with the controversial two-part finale, “These Are the Voyages… ” The finale infamously brought in cast members from The Next Generation to tell the final chapter in Enterprise’s story, and it was viewed by some as a disrespectful and ignominious end to 18 almost-unbroken years of Trek on the small screen. Generously put, many fans considered this a low point in the franchise’s history. 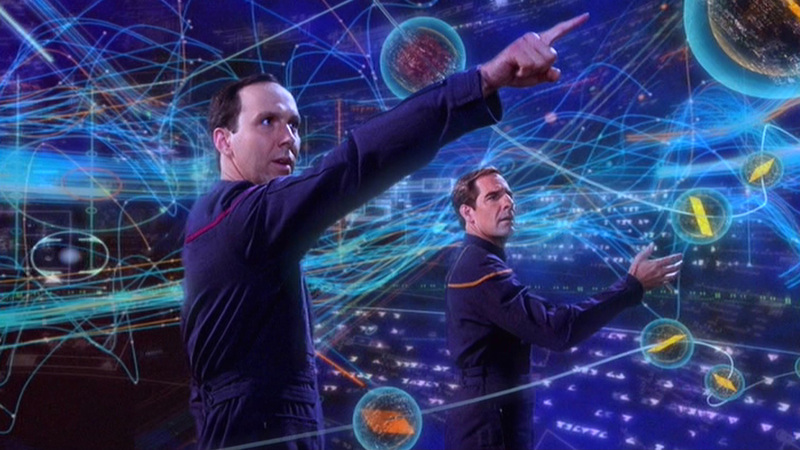 With Enterprise, some fans blamed the anemic finale on the series’ often-uneven writing. Others blamed Rick Berman, who had been Star Trek’s Nerd-in-Chief since Gene Roddenberry’s passing in 1991. And still others blamed the rise of “darker” and more heavily serialized sci-fi fare like Battlestar Galactica (although BSG showrunner Ron Moore first dabbled in this style, largely successfully, in the latter seasons of Deep Space Nine). Was this going to be the end of Trek as we knew it? Hindsight, of course, is VISOR-level clear. The latest era of Trek films has attracted some of the biggest names in film to the franchise, and a new series—Star Trek: Discovery—just debuted to plenty of fanfare despite its unusual viewing situation. With confirmed new films and seasons on the way, the future of Trek seems brighter today than perhaps at any other point in the voyages of the Starship Enterprise (or various other ships boldly going). So, what happened within the last dozen years to right this franchise ship? Let’s just say, resolving corporate machinations or creative differences doesn’t happen at warp-speed. Even at the lows of the Enterprise end, most people assumed that Star Trek was too valuable an intellectual property to disappear forever. But there were concerns at the time over how long the franchise would lie fallow before being revived; not to mention, what could a revival even look like at that point? Back then, Star Trek’s future faced complications that had nothing to do with scripts or a writer’s room. A month after Enterprise exited the stage, CBS split from the Viacom family it had joined in 1999. As part of the separation, CBS would retain the rights to distribute existing episodic Star Trek material and develop new series, but Paramount (still with Viacom) would have the rights to past and future motion picture projects. That uncertainty only increased with the sputtering flame-out of the TNG-cast films and the cancellation of Enterprise. Combined, they amplified fan concerns that it would be years before we’d see an effort to launch a new Star Trek project. But as it turns out, there were negotiations and rumors of negotiations before Enterprise’s body was even cold. Back then, as today, the Internet was rife with Hollywood rumors and future ideas or deals. Those looking for hope could find purported news of a whole host of Trek films and series in the works. And in early 2006, two strong contenders emerged: an animated series being pitched to CBS and a motion picture project at Paramount. The animated project was eventually titled Star Trek: Final Frontier. It would be set in the first half of the 26th Century, jumping almost 150 years forward from the events of Star Trek: Nemesis. The creators pitching the idea hoped that animation would provide, as it had for Star Wars, a way to create fresh stories in a beloved fictional universe without requiring skittish studio execs to approve expensive live-action productions. Snippets of character profiles and concept art found their way online, including sketches of 26th Century Starfleet uniforms and a boxy-but-recognizable riff on the USS Enterprise. CBS ultimately expressed an initial interest, according to the series’ development team, and a pilot script was created. The Star Trek: Final Frontier team has put lots of its initial art online. Here’s what the show’s captain, Captain Chase, would’ve looked like according to initial concept artist Jeff Parker. Storyboards for the first five Star Trek: Final Frontier scripts can also be found online. Here’s an early scene from the proposed pilot. Around the same time, the film project at Paramount started gaining steam when the studio reached out to J.J. Abrams and two of his frequent collaborators, Roberto Orci and Alex Kurtzman. All three were working with Paramount on Mission: Impossible III at the time, and Paramount asked Orci specifically—a known Trekkie—for ideas on reinvigorating the franchise. After multiple rounds of discussions, it was announced in April 2006 that J.J. Abrams would develop (i.e. direct and produce) the eleventh Star Trek feature film. Orci and Kurtzman were brought on board as writers, and Damon Lindelof (another frequent Abrams collaborator) would co-produce. The movie would revisit the 23rd century and revolve around the exploits of a young Captain Kirk and crew during and just after their time at Starfleet Academy. In essence, it was a reboot of the characters and premise of the original 1966 Star Trek television series—although Paramount insisted on referring to it as a “reimagining” rather than as a reboot (time would prove this was arguably for good reason). Incidentally, this wasn’t the first time that the idea had been floated of returning the franchise to Kirk & Co.’s school years. Harve Bennett, who had produced multiple original-cast Trek films in the 1980s, had pitched something similar (Star Trek: The First Adventure) for the sixth film in the series. That project never made it past a script. Abrams’ “reimagining” ultimately had something that Bennett’s hadn’t—the full backing of the studio. And Rick Berman, after helming the franchise for 14 years, had quietly been shown the door (through which he graciously stepped, to his credit). As far as Paramount was concerned, Abrams’ Trek would be the new Trek. While Abrams’ Trek pushed forward, the Final Frontier animated project would stumble on for only a couple more years. A few scripts would be written, a bit more concept art created. But by the time the first of the new films came out in 2009, this television counterpart was effectively dead. The series’ creators later chalked it up to layoffs at Startrek.com (once a potential distribution target) and management reshuffling at CBS Interactive. The world would have to wait for Star Trek’s return to the small screen.